Moncucchetto: a historic vineyard surrounding the winery’s main building with 20-year-old vines and even some 40-year-old vines. On granitic soil with a high content of organic matter, with a south/southwest exposure. 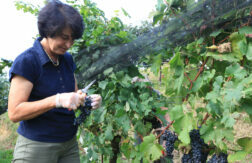 Vini: Moncucchetto Bianco, Moncucchetto and Moncucchetto Riserva. Agra: entirely rebuilt in 2006 and extending on the hillsides affording a broad exposure: Sauvignon Blanc facing west, Merlot facing east, and Cabernet facing south. Vini: Collina d’Oro Agra and Collina d’Oro Agra Sauvignon Blanc. 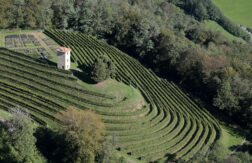 Bioggio: planted in 2010-11 on a partly terraced amphitheater, taking advantage of the particularly hot summer microclimate. On granitic soil with good drainage capacity. Vini: Bianco dell’Arco and L’Arco. Morchino: taking advantage of ample sunshine during the growing season despite having a northern exposure. Built in 2012 and planted with varieties as Johanniter, Solaris and Divico, which are resistant to fungal diseases, thus allowing a more environmentally friendly viticulture. Two new Moncucchetto wines are being created using these grapes.